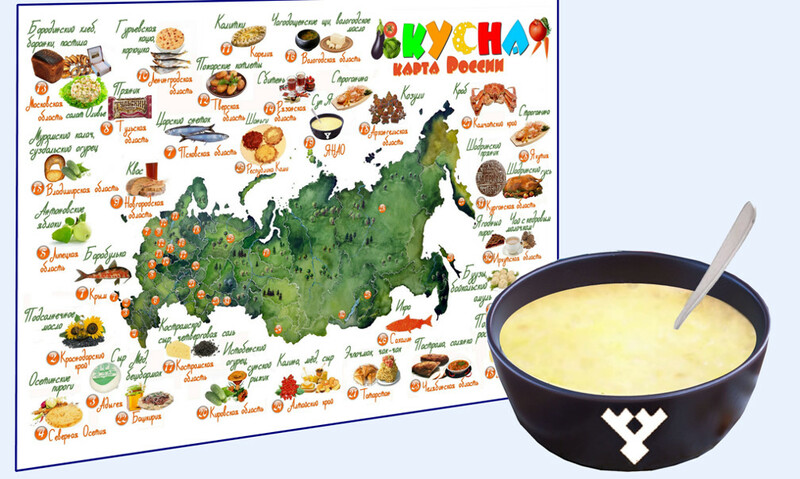 The soup from Yamal “Ya” will appear officially on “Tasty map of Russia” in the coming weekend within celebration of the 88th anniversary of Tazovskiy district. The festive events will be held on the 8th and the 9th of December, and the ethnic dish will become the 50th product representing regions of Russia on “Tasty map”. All participants and guests of the festivities will be able to taste the soup “Ya” and to learn secrets how to cook it at one of venues of the district day celebrating — the tourist center “Yasavey”. The program will include master-classes on making of Nenets souvenirs, riding snow tubing-sledges and snowmobiles, competitions in clay pigeon shooting and archery. Demonstration competitions on national ethnic kinds of sport are planned — jumping over narty (nomadic sleigh), throwing of a tynzyan on a khorey and mas-wrestling. (A tynzyan is a rope lasso for catching a reindeer; a khorey is a long pole for driving a reindeer sleigh). The following activities will take place in the house of culture of the district: on the 8th of December — the concert “Infinity of the mysterious land of Tasu’Yava”, on the 9th of December — the fair “Gifts of Tasu’Yava” on the central square of the settlement Tazovskiy. The soup “Ya” is a traditional Yamal dish. According to the press service of the governor of Yamal, “Ya” is translated from Nenets language as “ground, earth”, and the second meaning of the name of the soup is “flour”. A row of ingredients are added to rye flour in the soup. The dish will appear on “Tasty map of Russia” by the initiative and with support of the department of culture, physical culture and sports, youth policy and tourism under the administration of Tazovskiy district, which is actively developing domestic and event tourism and new tourist routes. In the future information about the traditional dish of Nenets cuisine will be included in description of tourist routes in the district. The cultural and tourist project “Tasty map of Russia” was started in 2012. It unites information about a place of appearing of products or recipes. Earlier “Tasty map of Russia” has already included Russian and Poshehonsky cheeses (Yaroslavl Oblast), Chagoda shchi — a fermented cabbage soup, Vologda butter (Vologda Region), Kvass (Novgorod Oblast), Murom kalach — a kind of bread (Vladimir Oblast), Istobensk cucumber, Suna saffron milk cap (Kirov Oblast), Guriev porridge (Saint Petersburg), Borodinskiy bread, Olivier salad (Moscow), Maundy Thursday salt — salt baked with rye bread or kvass sediments (Kostroma Oblast), Antonovka apple (Lipetsk Oblast), tea with “cedar milk” — Siberian pine nut milk (Irkutsk Oblast), Buuzy (Buryatia) and other products and dishes. “Tasty Map of Russia” — http://foodperestroika.com/2017/09/07/the-tasty-map-of-russia/.